Artist and retired fisherman Marco Randazzo does not usually give the rope crosses he makes to fishermen - too many would want them if they brought luck in the form of a mother load of fish for their boat. 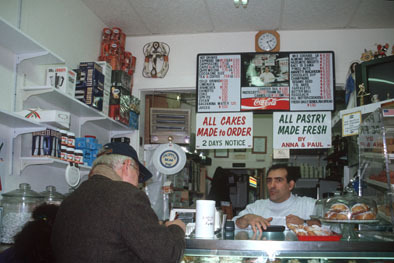 He did, however, present one to Paul Ciaramitaro, co-owner of Caffe Sicilia, an Italian pastry shop on Gloucester's Main Street and Marco's fishing companion for twenty years. One of Marco's life rings can be seen in the upper left hand corner of this photograph. Black lettering against white rope says, "to fishermen who rest at sea."